Thank you to all who linked up last week! I absolutely love all the projects you shared! There are so many talented people with great vision for otherwise passed over or sent to the trash pieces! This week has been busy! I have a few different projects on the go and none of them are finished! Ahhh! I did manage to make some space in the garage though by having a huge garage sale last weekend! I decided it was time to get rid of pieces I had collected with great intentions but never followed through on . Thank goodness I did as I brought home 2 new antique dressers to work on! I can hardly wait to get caught up on my current projects so I can get to work on these 2 sweet dressers! 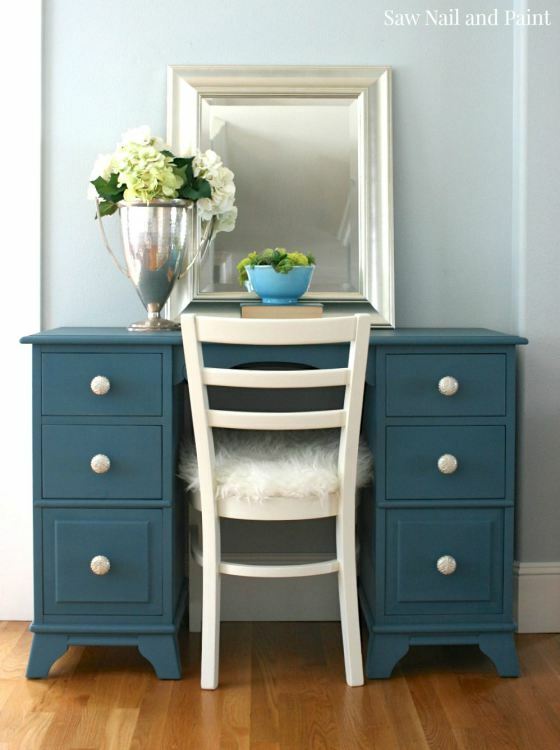 q is for Quandie shared this sweet night stand transformation. I love the gold accents and the hardware is dreamy! It looks so classy and rich now! Next Susan from Saw Nail And Paint shared her Seaside Blue Vanity. I love the color she chose for this piece. The way she styled it and her choice of hardware paired with the faux fur chair really makes it fresh and glamorous! You really must pop over to see the before picture! 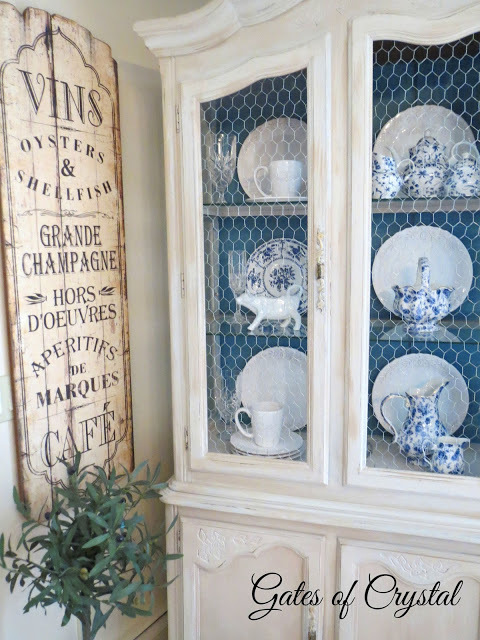 Brandy from Gates of Crystal shared this beautiful China hutch. I really like the freshness of this and the fun touch of a contrasting color inside really makes the wire stand out! Well done! 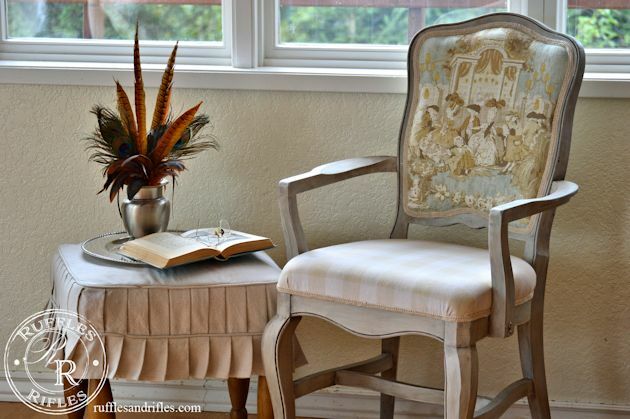 And I can’t help but also highlight this beautiful French Chair makeover by Cheryl from Of Ruffles & Rifles. Not only is the chair beautifully done but I love the little pleated slipcovered ottoman! So pretty! I hope you will pop over and see the amazing before and afters of these great pieces! Time to go ahead and link away! Thank you Terry, for your sweet highlight and feature. It is a delight to join your party. I was first introduced to you at MMS FFF and I was so inspired by a slip covered chair you did, it inspired me to do an ottoman. ☺️ Your work is always superb, and the genuine joy, encouragement and interest you take in others is so refreshing. Oh Cheryl, you are so sweet! It is readers like you that keep me going! You always have something uplifting to say, thank you for taking the time to pop by, read and give such great encouragement! I’m sorry you have no new projects to share but the older ones are always welcome as well! I look forward to many more visits with you Cheryl! You make me smile! Thanks again for the lovely party, Terry! I didn’t want to miss it (I’ve been doing a lot of non-furniture projects) so I’m linking up an older piece! Take care! 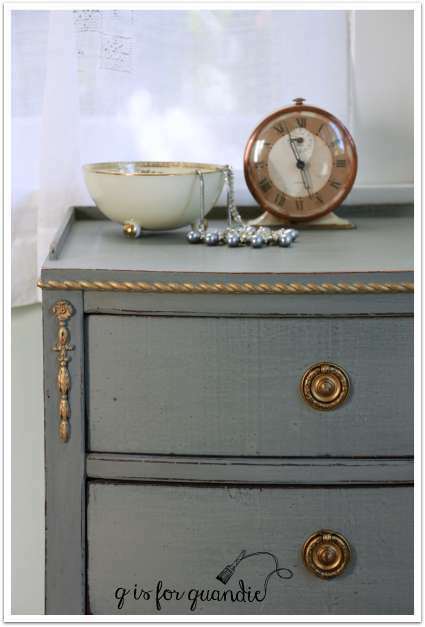 Thanks so much for featuring my nightstand Terry! You are so very welcome! Thank you for sharing! Hah! I made it this time! Thanks for hosting Terry! :) Have a great day! You are ALWAYS welcome to share your great work here! Thank you for joining! Hi Terry Thank you so much for inviting me to your lovely party! You are welcome here anytime Julie! I hope you will visit each week and share some inspiration! Thanks so much for the invite. I have added my kitchen island and will put you on my weekly party list to link up each week. Thanks again. Thanks so much for stopping by and inviting to your wonderful linkup! I’m so happy to join in. Great features!